Thomas Hunt Morgan studied fruit flies and found that in some crosses, expected outcomes weren't happening. Further experiments confirmed that alleles located on the same chromosome are inherited together. *Mendel's dihybrid cross AaBb x AaBb would not have yielded a 9:3:3:1 ratio if he had chosen alleles located on the same chromosomes. A common cross used to demonstrate linkage groups is the cross of a heterozygote wild type vestigial wings/ black body with a recessive mutant. There are two possible arrangements for the heterozygote (AaBb) in the above cross. If no crossing over has occurred, the outcome will always be 1:1, however this is not what Thomas Hunt Morgan observed. Question: How would you explain these results? Answer: The two offspring that did not look like either parent are called recombinants. They are a result of CROSS-OVER which occurred during meiosis, the alleles switch position. Using this methodology, the chromosomes of the fruit fly were mapped. Each MAP UNIT represents how far apart the alleles are on the chromosome, the number is based on how often crossing over occurs. 1. A dumpy winged (dd) fruit fly with long aristae (AA) is crossed with a long winged (Dd) short aristae (aa). Show the cross and the phenotypic proportions. 2. 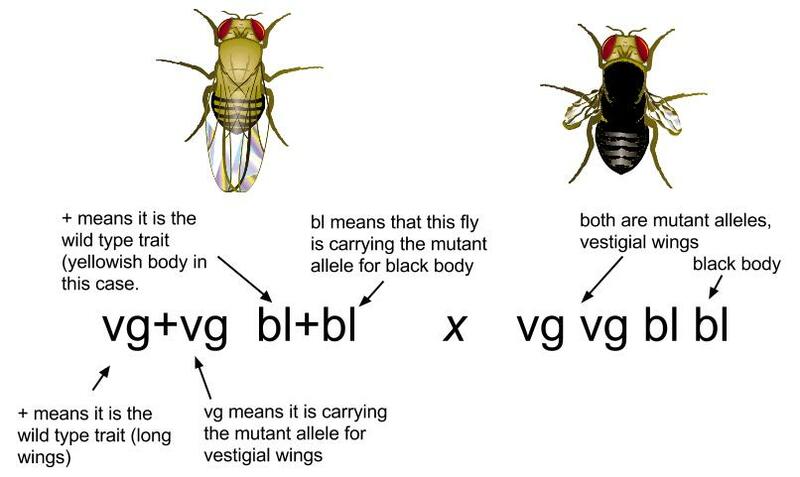 A fruit fly with short legs (ll) and vestigial wings (ww) is crossed with one that is heterozygous for both traits. 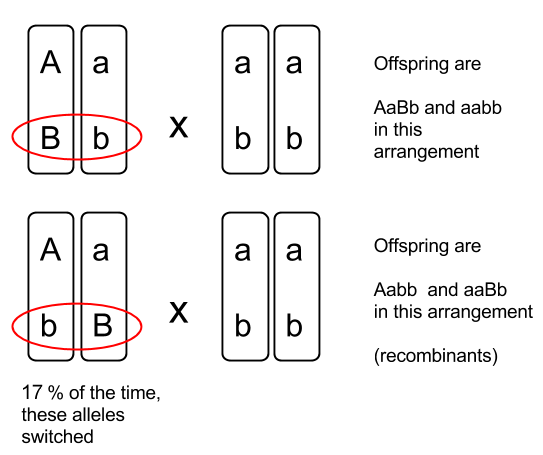 Assuming the dominant alleles are on separate chromosomes, show the cross and the expected phenotypic proportions. In pea plants, flower color and pollen shape are located on the same chromosome. A plant with purple flowers and long pollen (AaBb) is crossed with one that is recessive for both traits (aabb). a) Are the chromosomes of the AaBb parent in the cis or trans position? Sketch a punnett square showing the expected offspring. b) How far apart are the two alleles? *Fly chromsome map was made using etc clipart.